When I was a little girl, our family lived in Mobile, Alabama, and every year Mom and Dad would take us to the Mardi Gras parade to see the floats and make our attempts at catching candy and beads as they were thrown out into the crowds. Our next-door neighbor rode a float every year, and she would save us a necklace or two, just in case we didn’t luck into catching some. To a child all that mattered was catching treats and seeing the beautiful costumes that the people wore as the floats came by. Today one of the greatest treats during Mardi Gras season is the King Cake. In the January/February issue of Louisiana Cookin’, we have a splendid recipe for the Satsuma King Cake that you can make at home. The Creole cream cheese filing just adds the perfect touch. But if you want to purchase your cake, we have some great bakeries featured that you will want to try. In the bowl of a stand mixer fitted with a dough hook, combine yeast, 1⁄2 teaspoon sugar, and ¼ cup warm water; let stand until foamy, about 10 minutes. Add milk, vanilla, eggs, egg yolk, and remaining sugar. Beat at low speed until thoroughly combined, about 1 minute. Turn mixer off, and add flour and salt. Mix at medium speed until dough just comes together. Mix at high speed for 4 minutes. Add butter, and continue mixing until dough is smooth and pulls away from the side of the bowl, about 6 minutes. Remove bowl from mixer. Cover with plastic wrap and let stand until doubled in size, 1 ½ to 2 hours. Punch down dough, and turn it out onto a well-floured surface. Using a floured rolling pin, roll the dough into an 18-inch circle, about ¼-inch thick. Cut a ½-inch hole in the center of the circle, and pull with your fingers to widen. Place dollops of Creole Cream Cheese Filling evenly around circle halfway between outer edge and inner hole. Drape outside edges over filling and continue rolling outside inward until filling is covered, widening inner hole as needed, until dough covers the seam. Transfer to a baking sheet lined with parchment paper; cover with plastic wrap and let stand for 1 hour. Uncover cake, and bake until golden brown, about 30 minutes. Let cool completely. In a small bowl, whisk together confectioners’ sugar and buttermilk until smooth. Transfer cake to a cutting board or serving platter; spread buttermilk glaze evenly over top of cake and sprinkle evenly with Mardi Gras Sugar. Get the full recipe, including the Creole Cream Cheese Filling, Creole Cream Cheese, Satsuma Jelly and Mardi Gras Sugar. The issue is really a celebration of great bakeries who offer their specialty versions of King Cakes. I think the King Cakes and all the variations should be served year-round just because they are so delicious. But as the Feast of Epiphany begins and these delicious pastries emerge, I salute the genius pastry chefs who create these masterpieces. 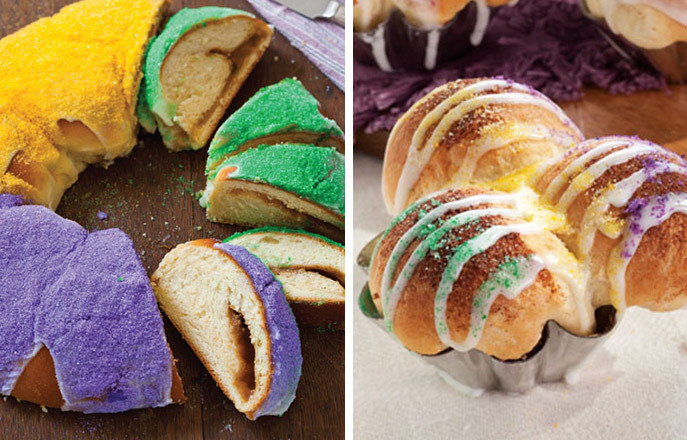 Enjoy the season, and celebrate with a scrumptious King Cake. 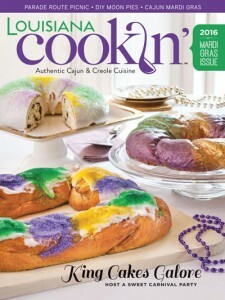 Go to our website louisianacookin.com for more information and inspiration for your Mardi Gras baking. What is your Mardi Gras tradition? Today is Mardi Gras Day. We went to see Rex, Elks Krewe of Orleanians and Krewe of Crescent City. Gras are purple, green and gold. The Purple represents justice, the green represents faith and the gold represents power. Some krewes have official posters. Next year’s Mardi Gras Day will be Tuesday, February 28, 2017. Remember, the parades start about 2 weeks before that. Mardi Gras is a part of our life growing up here. There is nothing else like it. Laura, what an interesting post! Thank you for sharing your knowledge! Thank you for sharing! It is on my bucket list to attend a fun and safe Mardi Gras parade and taste a king cake! I have given great thought of ordering one and having it shipped. I have cut out several recipes over the years. Your sharing may be as close as I get! Sounds like so much fun!! Maybe someday! King Cakes are so much fun. Did you bake a tiny porcelain baby inside? In our family the Polish tradition is to have Paczki, (pronounced like “punch-key”), or what some also call Fat Tuesday Doughnuts. They are a yeast based doughnut traditionally filled with stewed plum or rose hip jam and can be glazed or dipped in sugar. My favorite are the plum ones as they filling is slightly tart and contrasts deliciously with the glaze. Annie, LOVED that you shared that family tradition! Sounds wonderful. Now that is another great sounding recipe and tradition to share and embrace. Would love to have it!! I love this idea! I too am Polish from my mom’s side but we never had Paczki! I would love the recipe! Sorry to say we cheat and buy them locally since we each only eat one, extras would be just too tempting! Any good yeast doughnut recipe would work, just fill them with slightly tart plum jam.